Key West, Florida (November 1, 2017) – Hemingway Rum Company, the makers of Papa’s Pilar® Dark and Blonde rums, is proud to introduce a limited-release of 1,400 6-pk cases of a special-edition Sherry Finish in select U.S. markets. The award-winning, premium sipping rums, which are inspired by Ernest “Papa” Hemingway’s spirit of adventure, are hand-selected from ports-of-call in the Caribbean, Central America and Florida for their age, character and maturity. The team of Master Blenders created this special edition expression of custom barreled Papa’s Pilar Dark, with seven different hand-selected rums up to 25 years old, which are both pot and column distilled. After solera aging in Bourbon barrels, Port Wine casks, and Spanish Sherry casks, the bold and complex rum was further aged in Spanish Oloroso Sherry casks for approximately 30 days, creating a unique flavor profile. In a quest to get rum back to its roots, the Papa’s Pilar Production team chose to embrace a similar methodology used in Scotch Whiskey, with the goal to allow the rum blend to continue to meld together, while also interacting with the Sherry and French Oak. It’s also a method used by Cuban rum makers in their best rums, as they cannot easily source used American Bourbon barrels. The team chose to use French Limousin Oak Sherry casks from Jerez de la Frontera, Spain, and only for a short period of time, because the grain structure of French Limousin Oak is wider and more open than American Oak Bourbon barrels (300L vs 200L). Papa’s Pilar is meant to rekindle a sense of adventure in us all. 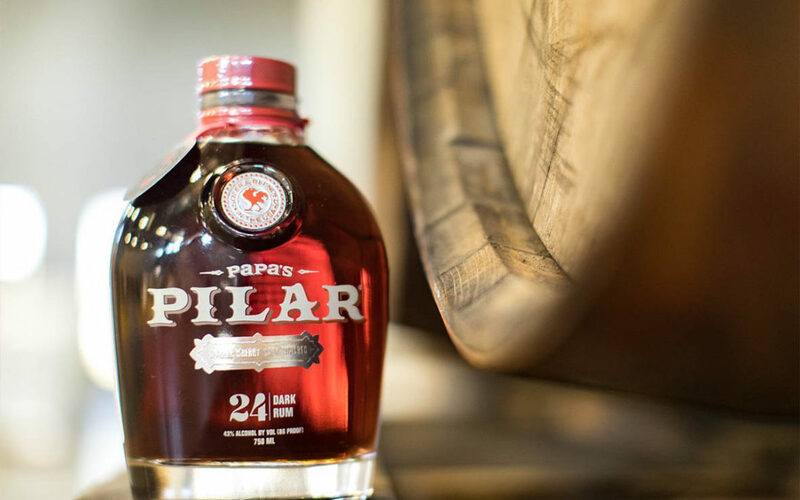 “Papa” lived an epic life full of perpetual motion, and Papa’s Pilar was crafted to accompany rum enthusiasts as they sink their teeth into life. Named for his muse and one true constant, Pilar is the vessel that allowed America’s literary giant to reach beyond the shoreline, feast on life and remind us to never be a spectator. Every aspect of Papa’s Pilar is thoughtful and purposeful. The distinct bottle evokes Papa’s exploits through a form factor reminiscent of an iconic WWII canteen. The special-edition expression will hit shelves in the Papa’s Pilar signature bottle, featuring a red closure to distinguish the Sherry-finished rum from it Dark and Blonde counterparts. Papa’s Pilar recently opened a new distillery and experience center in Key West, Florida, further honoring Hemingway’s contribution to the classic spirit of the city in which he once lived. The over 8,000+ sq. ft. facility supports Papa’s Pilar rum production and features an Experience Center, Tasting Room, Trading Post, and eventually, a rentable event center. Visitors can view a 350-gallon Hamilton Pot Still, with a custom-made reflux column, that can produce up to 80 gallons of rum per day. Papa’s Pilar was developed in conjunction with Ernest Hemingway’s estate. The Hemingway family donates 100 percent of their royalty profits to organizations that embody the likes of adventure, literacy, and conservation. The suggested retail price of the Sherry Finish is $44.99 – $46.99, which will vary by market. The special-edition expression is available in 750ml bottles in both on- and off-premise establishments in: California, Florida, Georgia, Illinois, Indiana, Kentucky, Louisiana, Massachusetts, Michigan, New Jersey, New York, Tennessee and Texas. Hemingway Rum Company, LLC is a distilled spirits company based in Florida that’s dedicated to producing super-premium multi-sourced solera blended artisanal rums. The Company’s inaugural offerings are Papa’s Pilar® Dark and Blonde rums, incepted and crafted by a seasoned team of best-in-class partners. The Company encourages consumers of legal drinking age to Live Courageously and Drink Responsibly and proudly supports local organizations that serve Ernest Hemingway’s adventurous, literary and conservational legacy. Chicago, Ill. – (October 9, 2017) – Argo Tea®, the Chicago-based premium tea brand known for its all-natural tea-based signature drinks and loose-leaf teas, is partnering with Whole Foods Market to launch the world’s first line of ready-to-drink (RTD) cold brew single estate bottled teas into the retailer’s stores nationally. The release of the RTD line follows a successful test of the handcrafted single estate cold brew teas in the company’s Argo Tea cafés last year. With the new Single Estate Cold Brew Tea line, Argo Tea is at the forefront of the emerging cold brew tea segment. By slowly cold-brewing the world’s premier single estate teas, the company is able to extract high concentrations of the right tea cells – flavonoids and antioxidants – giving the teas an exquisite, smooth flavor. Yoshiaki Tsutsumi of Yamaguchi Tea Estate concurred, “Argo Tea is truly at the forefront of beverage innovation. Consumers are seeking out unique, authentic flavors and we are proud that our Gyokuro green tea will be a part of this special line of cold brew teas. The unique and flavorful super-premium teas are USDA Organic certified, Non-GMO Project Verified, all-natural, gluten-free, vegan and kosher. To enhance the natural character of each tea, Argo adds a hint (20 calories per 13.5oz bottle) of fair-trade pure cane sugar to each flavor. 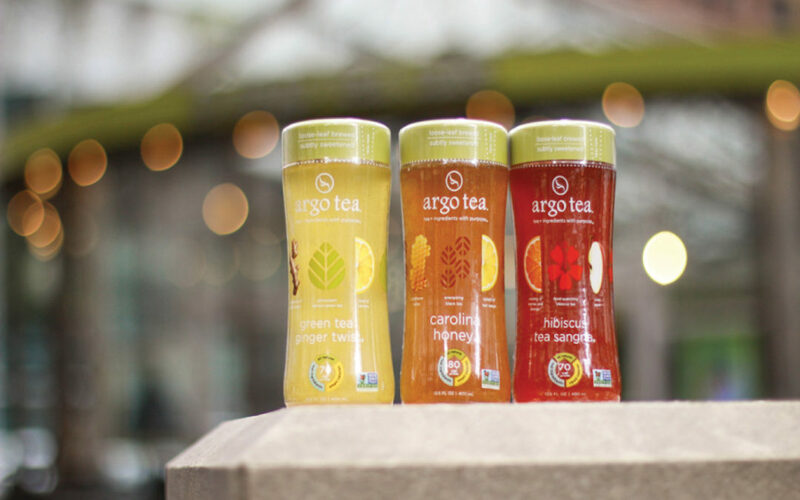 All three flavors are bottled in Argo Tea’s iconic glass bottle, preserving the delicate flavors of the teas. Each tea has a suggested retail price of $2.49-$2.69. Argo Tea will support the new product introduction with in-store sampling demonstrations, digital advertising, social media and email marketing. The new line complements Argo’s existing premium RTD business. The company sells six Signature RTDs, three Unsweetened RTDs and three Teappuccino RTDs nationwide in over 50,000 retail outlets and in all of the company’s 50 cafés.